Ontech Systems provides efficient, reliable IT support services to Hartford based businesses as well as the Greater Milwaukee area. With a client retention rate of 98% over the last 10 years, Hartford, WI businesses have trusted Ontech Systems to maximize their productivity and efficiency through comprehensive IT support and solutions. We customize our service to fit your needs – we can act as your outsourced IT department or work side-by-side with your in house IT staff. Since 2004, we have worked closely with small to medium sized businesses in Hartford, WI, to plan, implement and maintain their IT systems. 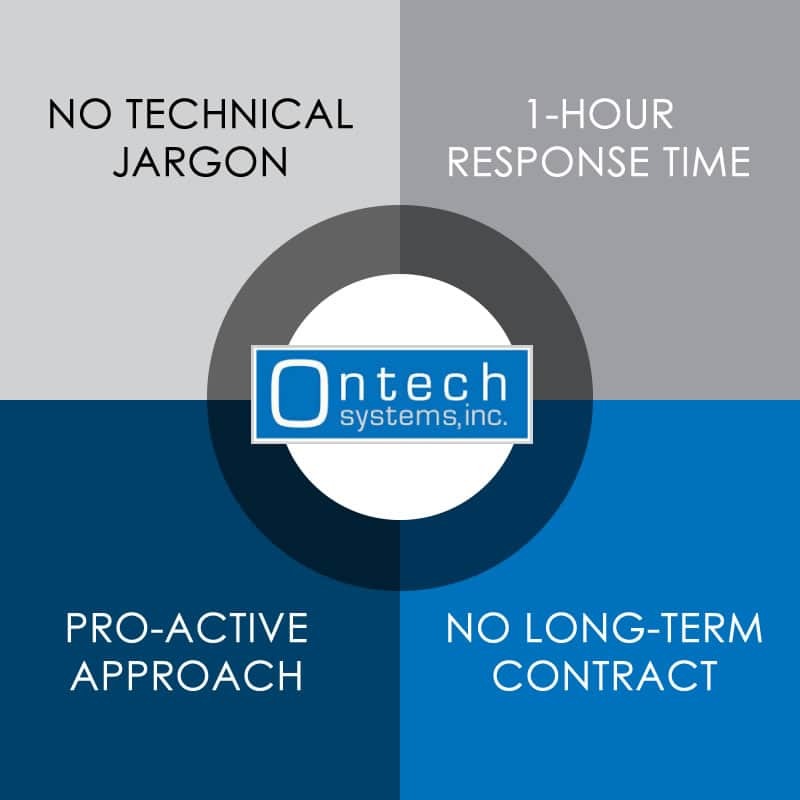 What sets Ontech Systems apart from other Hartford IT support providers? Our technicians keep you informed of what they are doing in terms you understand, no matter what your level of IT knowledge. We want to be an integral part of your business, so we communicate with you without technical jargon. Quick response time. When you contact us during normal business hours, we respond by phone or email within 1 hour—not hours, days or even weeks later. We get your network up and running as quickly as possible, because if you’re not “on,” you’re not profitable. Our pro-active approach means identifying weaknesses within your network ahead of time as opposed to fixing them later on. Before you even become a client, Ontech can run an audit of your existing system, identify vulnerabilities and discuss suggestions with you during our free Network Discovery. No contract is required. Our clients are satisfied and stay with us because they want to—not because are locked into a long term contract. As a first step, request a free, no-obligation network discovery. We will evaluate your current network and offer ideas to improve the productivity and efficiency of your Hartford, WI business.